Genesis Pathfinder is an inflatable space habitat scheduled to launch in November 2005. Genesis weighs in at 1,360 kilograms and is approximately 4.6 meters in length by 1.9 meters in diameter; this is a one-third scale model. It's diameter will double once in orbit. The full-sized inflatable module, called Nautilus, will contain about 330 cubic meters of usable volume. Bigelow Aerospace has picked up where NASA's TransHab project stopped. 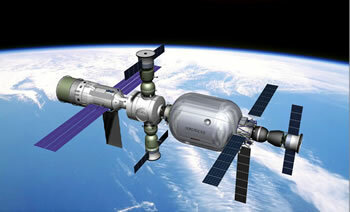 TransHab had already undergone testing for use as part of the International Space Station. Technical issues and wrangling over funding eventually "punctured" the TransHab project. In taking over the project, Bigelow Aerospace has taken over two patents that NASA held on inflatable space structures. The bubble had inflatable seats and an inflatable table and was there for exercise and killing time but it also provided a fine view; the surface was perfectly transparent. Unfortunately, it appears that Niven never filed for any patents on this idea.